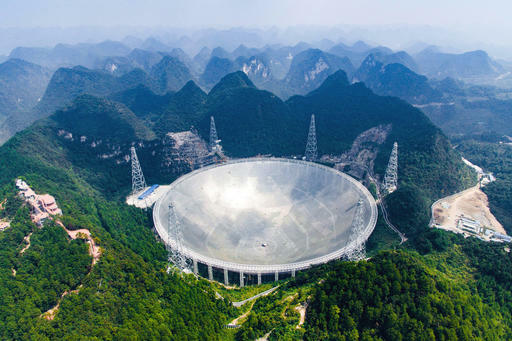 The world's largest radio telescope began searching for signals from stars and galaxies and, perhaps, extraterrestrial life Sunday in a project demonstrating China's rising ambitions in space and its pursuit of international scientific prestige. Beijing has poured billions into such ambitious scientific projects as well as its military-backed space program, which saw the launch of China's second space station earlier this month. 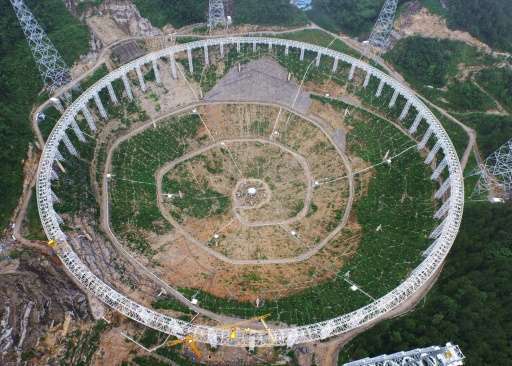 Measuring 500 meters in diameter, the radio telescope is nestled in a natural basin within a stunning landscape of lush green karst formations in southern Guizhou province. It took five years and $180 million to complete and surpasses that of the 300-meter Arecibo Observatory in Puerto Rico, a dish used in research on stars that led to a Nobel Prize. The official Xinhua News Agency said hundreds of astronomers and enthusiasts watched the launch of the Five-hundred-meter Aperture Spherical Telescope, or FAST, in the county of Pingtang. Researchers quoted by state media said FAST would search for gravitational waves, detect radio emissions from stars and galaxies and listen for signs of intelligent extraterrestrial life. "The ultimate goal of FAST is to discover the laws of the development of the universe," Qian Lei, an associate researcher with the National Astronomical Observatories of the Chinese Academy of Sciences, told state broadcaster CCTV. "In theory, if there is civilization in outer space, the radio signal it sends will be similar to the signal we can receive when a pulsar (spinning neutron star) is approaching us," Qian said. Installation of the 4,450-panel structure, nicknamed Tianyan, or the Eye of Heaven, started in 2011 and was completed in July. The telescope requires a radio silence within a 5-kilometer (3-mile) radius, resulting in the relocation of more than 8,000 people from their homes in eight villages to make way for the facility, state media said. Reports in August said the villagers would be compensated with cash or new homes from a budget of about $269 million from a poverty relief fund and bank loans. CCTV reported that during a recent test, the telescope received radio signals from a pulsar that was 1,351 light-years from Earth. The radio telescope has double the sensitivity of the Arecibo Observatory, and five to 10 times the surveying speed, Xinhua said. China has also completed the construction of tourist facilities such as an observation deck on a nearby mountain, reports said. Such facilities can be a draw for visitors—the one in Puerto Rico draws about 90,000 visitors and some 200 scientists each year. Earlier this month, China launched the Tiangong 2, its second space station and the latest step in its military-backed program that intends to send a mission to Mars in the coming years. In August, the country launched the first quantum satellite experts said would advance efforts to develop the ability to send communications that can't be penetrated by hackers.